One of the hallmarks of Nonverbal Learning Disabilities (NLD) is difficulty with social rules. People with NLD don’t automatically get the social conventions that their non-NLD peers seem to absorb without even trying. People with NLD are usually smart and advanced in their areas of interest. But they also tend to be logical and inflexible thinkers, and, let’s face it, social rules can be pretty complicated and not necessarily logical. It’s easy for them to dismiss rules that make no sense, and not listen to ideas that seem unimportant. Consider, for example, the third grader whose crime was arguing with a teacher. In the lunchroom, he was required to eat his sandwich before his brownie. He would argue that they ended up in the same place, so what was the point? He was right. We talked about the pros and cons, being right vs. getting in trouble. He opted to stop getting in trouble. Social rules can be taught; they can also be learned by watching and listening carefully. In dealing with children with NLD it helps to think like an anthropologist—to imagine investigating a culture completely different from your own. If you’re in Japan, you automatically bow to indicate respect. In some Middle Eastern countries allowing the bottom of your shoe to be seen is insulting. It’s a matter of custom, not logic. Now, turn that awareness toward home. Each setting your child operates in— family, school basketball team, church— has its own culture and expectations. A fourth-grade boy with NLD hugged people to express positive feelings. He was joining a town basketball team. We talked about the culture of the team and how the boys express approval—a comment, a fist bump, and a slap on the behind. He very much wanted to fit in, so he did the same. But he also had to learn that it’s not OK to slap on the behind in class; the rules there are different. He had to watch boys in each setting or “culture” to “get” the rules in that setting. Most kids with NLD don’t want to argue with social rules; they simply don’t “get” them. 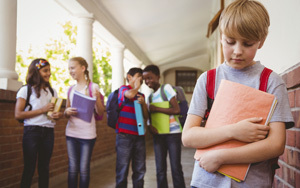 A middle school considered a boy potentially dangerous, misinterpreting his limited facial expressions and lack of interest in joining other kids as “provocative.” Their example: when a science teacher showed a funny movie as a break from class, the boy asked, “What does this have to do with science?” This behavior was breaking unspoken rules of the classroom. The boy didn’t know how to join; he was asking a “literal thinking” question. The school needed to help, not misinterpret his challenges. It’s vital that people in the environment of kids with NLD understand their behavior and challenges. They’re not being oppositional or difficult purposefully. They need understanding and help with learning what’s best to do. They need to be able to be productive and to participate in a way that works for them and for others. Take, for example, the case of a bright college student who needed to go through a complex process to get to the point or solve certain problems. He was detail-focused, whether on schoolwork or in talking to peers. He had to work twice as hard as his friends to meet his own high standards, and was impatient with his professors and many peers. He often didn’t follow lectures and needed to ask seemingly endless questions about details to come to a full understanding of ideas. He needed extra time and help to achieve the impressive depth of understanding he sought. With those accommodations, he was among the top students in his class. He sought out peers who valued his intelligence and his caring, without feeling the need to be involved in a large social crowd. How do you get kids accommodations, as well as understanding and help for social skills? It’s challenging: many school systems aren’t familiar with NLD or don’t accept the diagnosis. It’s important to have comprehensive testing by someone who understands NLD and who can explain in detail in a report the challenges and needs of these students. Ironically, if these children had an autism spectrum diagnosis, their difficulties with social issues would be more accepted or at least anticipated. Marcia Eckerd is an evaluator, consultant, and therapist who specializes in working with children with NLD and autism-spectrum disorders. This article originally appeared on PsychCentral.com as Aspergers, Nonverbal Learning Disorder (NLD), and Families. All rights reserved. Reprinted here with permission.